For dessert, Michelle prepared a recipe from Martha Stewart for the South Arm Seniors Kitchen. This cake has the elements of gingerbread which fits for the season. 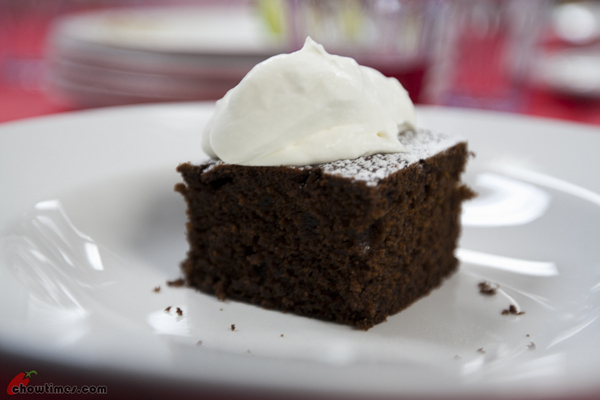 This Gingerbread Snacking Cake freezes well. You can serve this cake with a dollop of whipped cream or ice-cream for a treat. The aroma of molasses filled the kitchen while the cake is baking. This cake is light and fluffy. 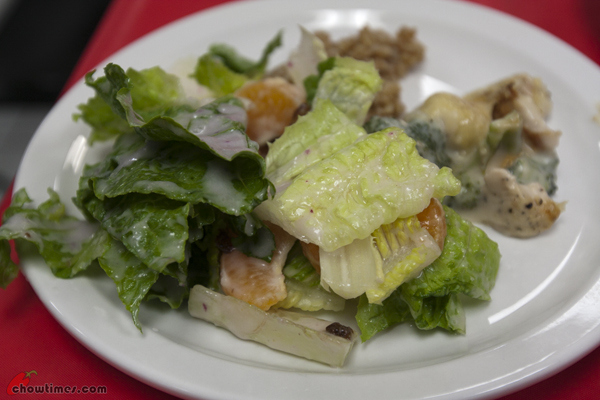 Besides the Orange and Pecan Salad with Red Onion Dressing, Michelle also prepared another side dish for the South Arm Seniors Kitchen. The seniors had expressed their interest in learning more about grains. Michelle brought a grain called Farro to make a simple side dish. There are other grains which are very similar to farro like emmer, spelt and einkorn. 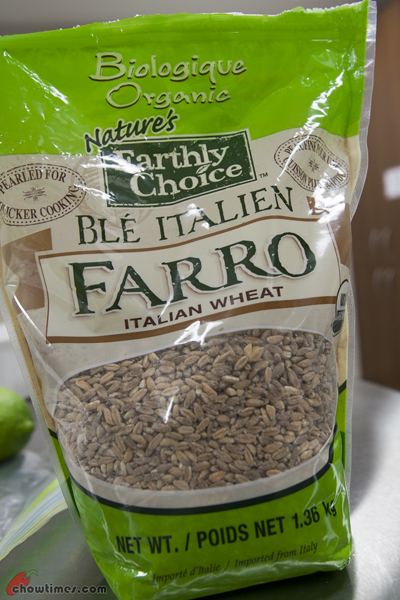 Barley also has similar characteristic as farro and so, you may substitute farro with barley in recipes. Farro can be eaten plain or used in salad and soups. Here is the recipe for a spelt salad and some barley soups (Herbed Lentil and Barley Soup, Hearty Bean Barley Soup, Barley Yogurt Soup and Mushroom, Barley and lentil Soup) that I had blogged before. Farro is sold dried and is prepared by cooking in water for about an hour or more until soft, but still crunchy (it is recommended first soaking the farro over night). 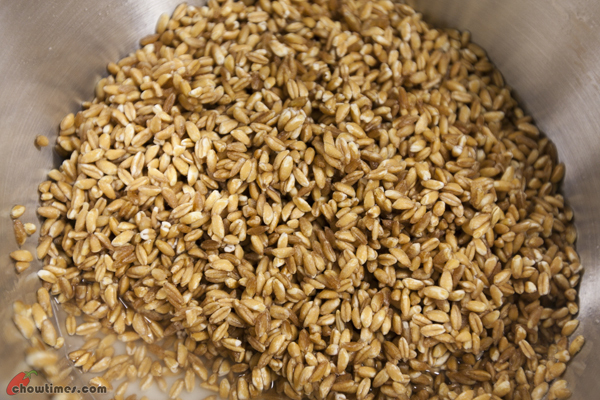 The ratio of water to grain to cook the farro is 2 to 1. 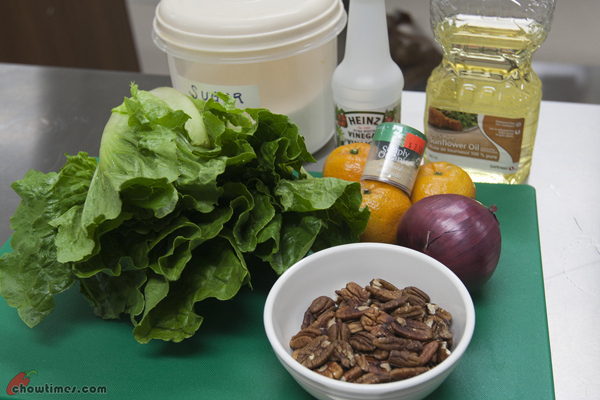 For side dish, Michelle prepared an Orange and Pecan Salad with Red Onion Dressing at the South Arm Seniors Kitchen. You can make the dressing ahead of time and keep in the fridge for up to 2 weeks. You can use fresh oranges, canned oranges or mandarin oranges in this salad. Other fruits like strawberries and kiwis can also be used. We like that we can taste the onions in the dressing and yet there is no chunks of onions to bite into. This is the first time I return to the South Arm Seniors Kitchen after the summer break and South Arm kitchen renovation. I think I missed at least one kitchen due to my trip to Beijing. The new senior kitchen facilitator is Michelle Li. 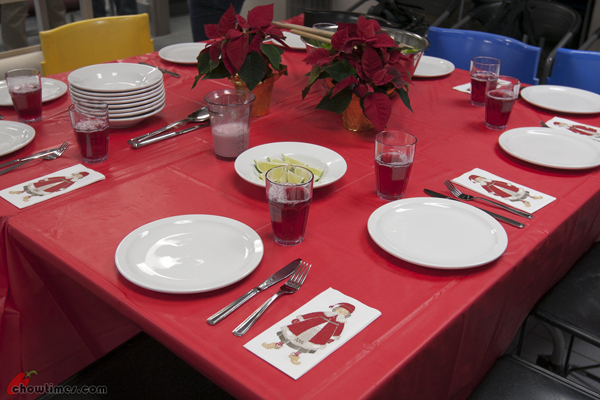 Stella, the South Arm seniors program coordinator decorated the table with a Christmas theme since this is the last kitchen in December. 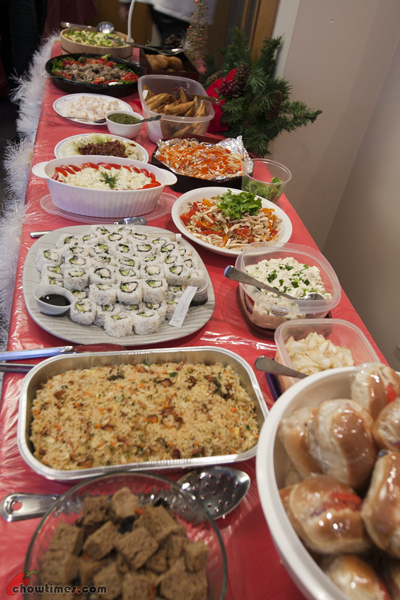 Michelle also prepared some festive recipes which can utilize leftover food from the holiday feast. Here is some tips that Michelle shared with the seniors on food safe regarding leftovers. The excerpt is adapted from dietitian Heather McColl. Ensure the fridge is at the correct temperature, 4 degrees Celsius or colder; a fridge thermometer is a great tool to have. Cool food quickly by storing in shallow containers on your refrigerator’s wire shelves to promote maximum airflow and even cooling. Chill large pieces of mat or poultry quickly and safely by deboning and dividing into small portions before storing in the refrigerator. Since you cant tell the safety of food by its look, smell or taste, a good rule of thumb is “when in doubt, throw it out”. 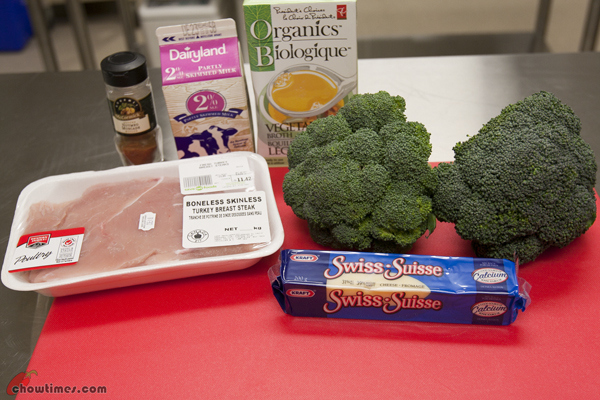 The main course for this kitchen is Swiss Turkey Broccoli Bake. This is a good recipe to encourage kids to eat vegetables with the incorporation of a cheesy creamed sauce. 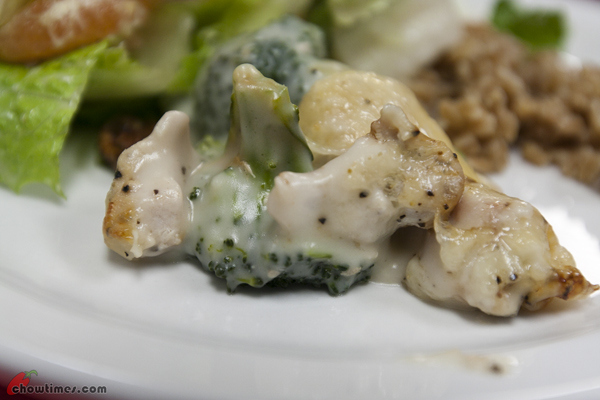 This recipe is a great way to use up leftover chicken or turkey and already cooked vegetables. Leftover can be packaged into individual portions and freeze for enjoyment later. Updated 3rd Oct 2014; This restaurant is closed. Nanzaro told me that there is a new Hong Kong style restaurant in Lansdowne Mall. He saw that in a flyer while I’m not around town. But he cannot remember the name of the restaurant. I could not search any information about the restaurant since I do not know the name. However, Nanzaro said it’s part of the Top Gun group. So, I checked the Top Gun group website and still there is no information of any Hong Kong style restaurant. My guess is that the new restaurant must be at the old California Cafe location. My guess is right on the dot. We went there on Saturday around noon and there was a line. The boys did not want to wait. So, we came back on Sunday just after their opening hour, 11:00am. We reached Rhino’s Kitchen at 11:15am and the manager told us there is a 20 minutes wait. Well, this time we waited. 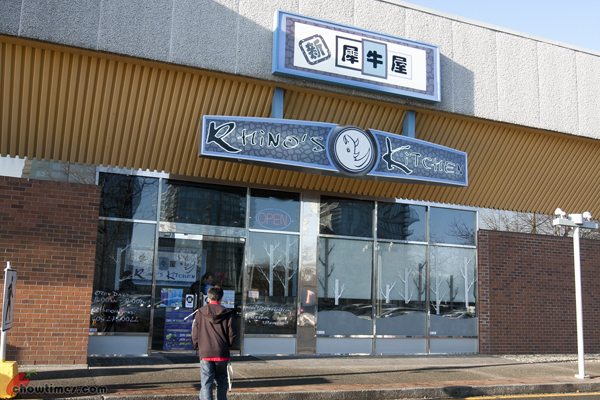 Nanzaro is right about Rhino’s Kitchen belongs to the Top Gun Group. 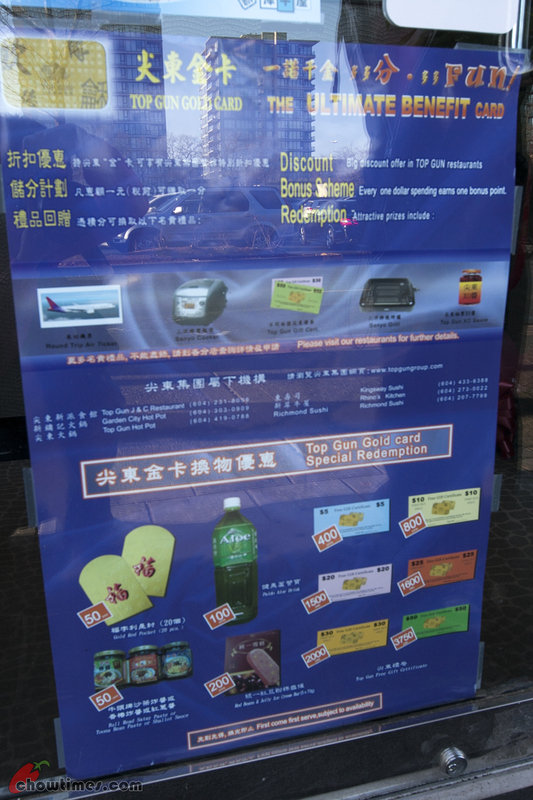 The above poster was displayed at the door. You can click on it to have a larger view. Being part of the Top Gun Group, I think the card holder will enjoy some kind of discount. Anyway, I’m not a card holder, so I do not know what is the discount like. We waited for almost 30 minutes before we got a table. The restaurant is really busy. Apparently, it has just opened for a week. I overheard the manager chatting with a customer that the staff is not experienced enough to handle the crowd. The partitions in the restaurant make it feel a bit cramp but it did create a bit of privacy instead a big open space. 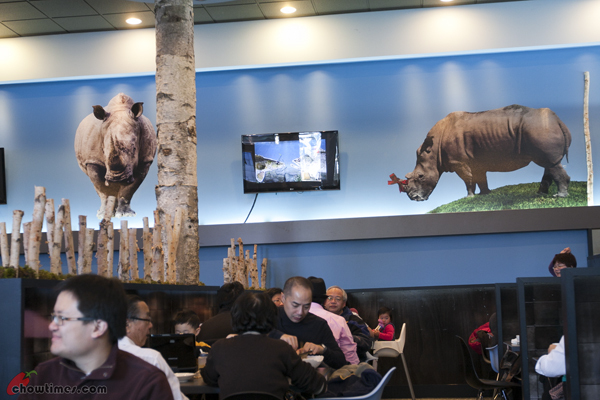 The wall is decorated with pictures of rhinos. I wonder what is behind the name Rhino. Anyone has any idea? 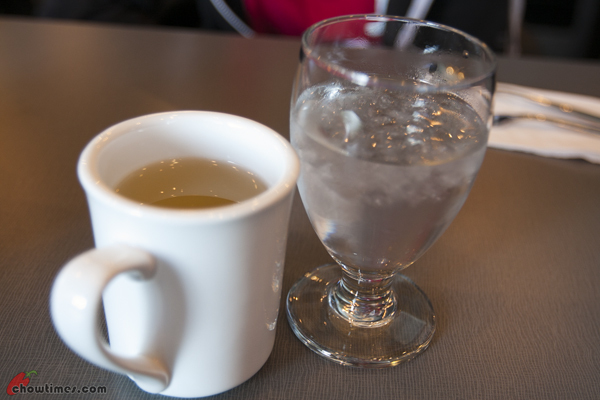 Unlike most Chinese restaurant which will serve hot tea without asking, here the server will ask if you want hot tea or ice water before serving. It’s a good practice so that we dont have to end up with two extra cup of hot tea which my boys dont drink. They always ask for ice water. 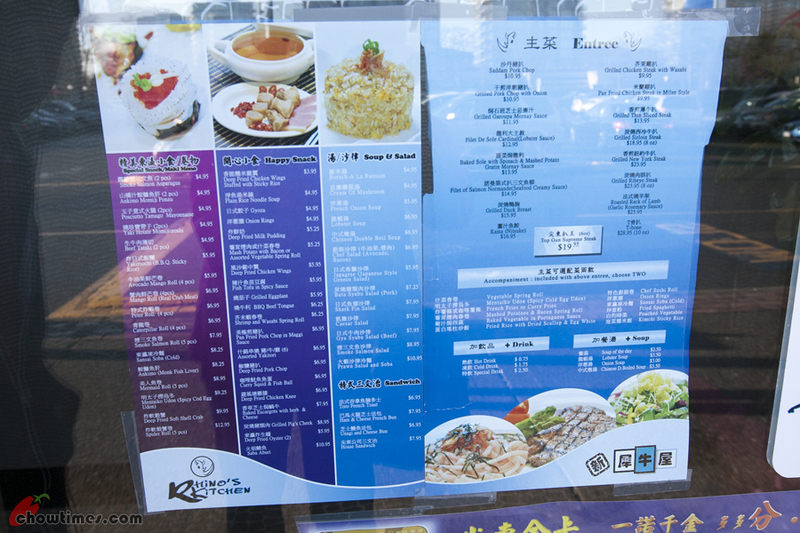 Rhino’s Kitchen has the typical Hong Kong style food. 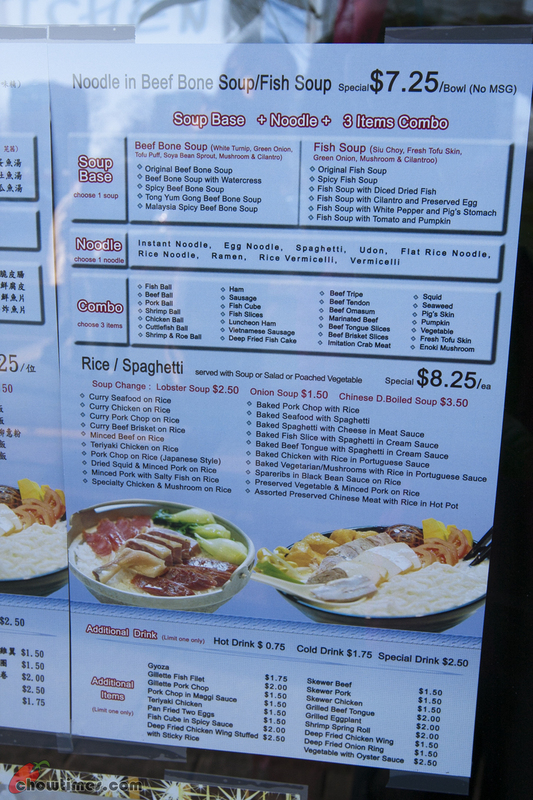 On top of that they also have the Build Your Own Noodle Combo for $7.25. You can click on the menu to have a larger view. 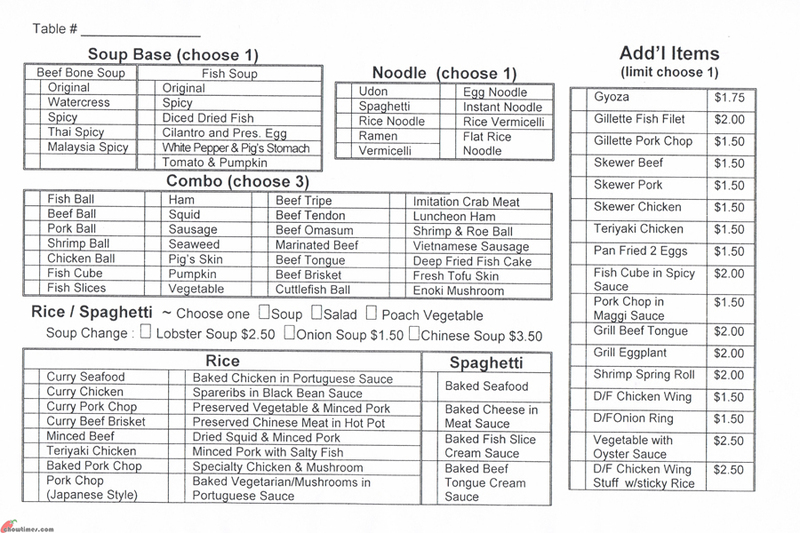 The above is the order sheet for the Build Your Own Noodle Combo and Rice/Spaghetti combo. You can click on it to have a large view. Ben, Suanne, Arkensen and Nanzaro wishes all a very Merry Christmas. 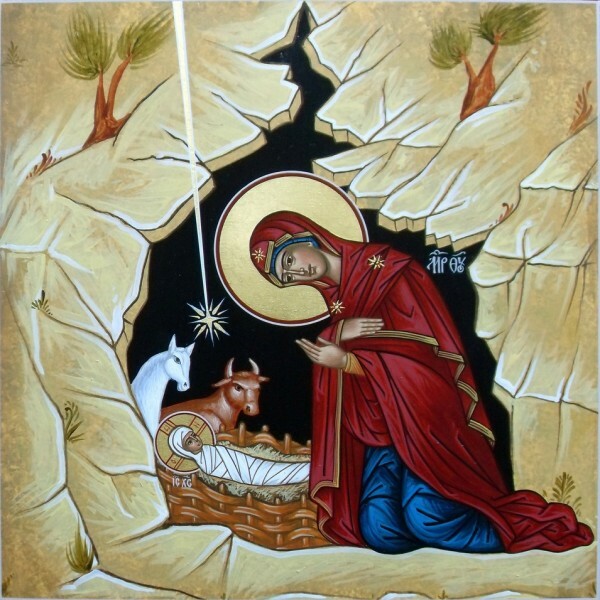 May this Christmas brings joy to the world. 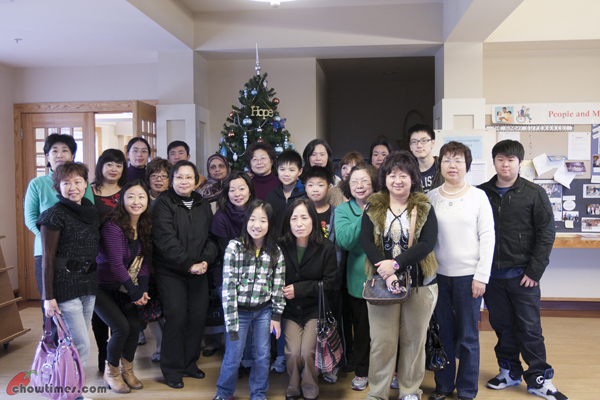 The Richmond Community Kitchens celebrated Christmas with a potluck at Gilmore Park Church. 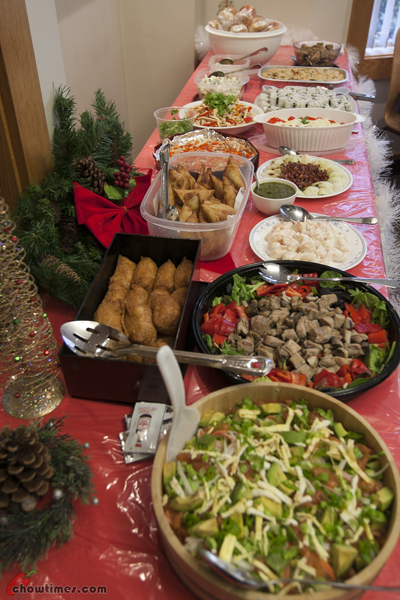 We are very grateful for the church to allow us to use their facility for this potluck. Old, new and existing members and friends attended this potluck. Some of the members also brought along their kids since the kids are on their winter break. The more people the merrier. We had a lot of food to share. The above are the savory dishes. 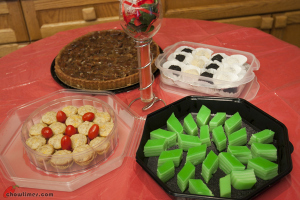 There were not many items on the dessert table. 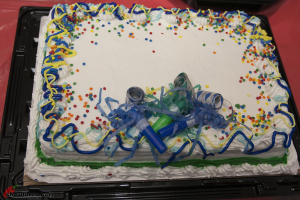 The cake is sponsored by Safeway as I was told. 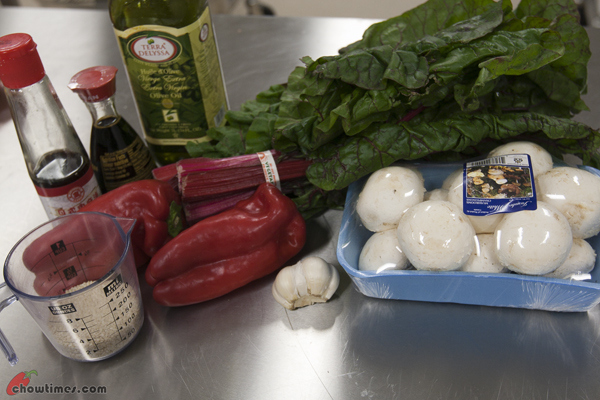 The second dish that Minoo prepared for the South Arm Community Kitchen is a stir fry vegetable dish that incorporated Swiss Chard. 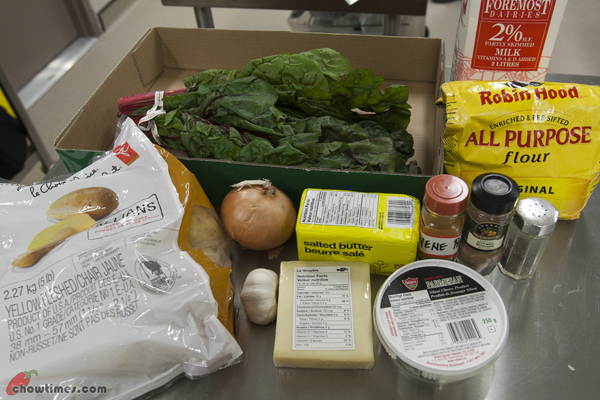 Swiss Chard is a fall vegetable but it is easily available in winter in the groceries stores. This is a hardy and versatile vegetable that can be used in soup or stir fry. It is rich in dietary fiber. It is high in vitamin A, K and C.
We love the color of this stir fry dish, which is very Christmasy. The sesame seeds add crunch and nuttiness to it. The other 2 recipes had been covered before; i.e. Salmon and Potato Chowder and Oatmeal Blueberry Muffin. 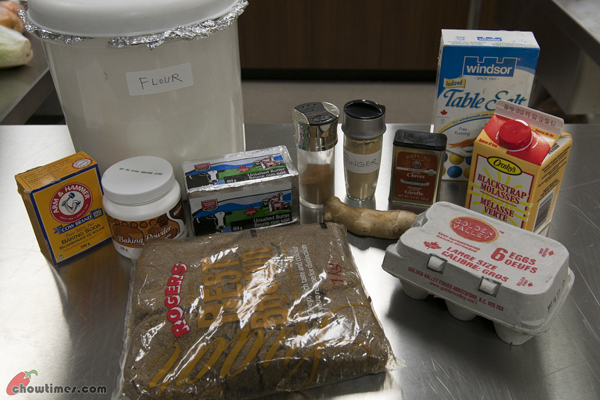 Minoo prepared 4 recipes for the South Arm Community Kitchen. This is my first time to the kitchen since it’s renovation. I love all the stainless steel appliances and the addition of a convection oven. It takes time to get to know where the pots and pans and utensils are stored in a new kitchen. The first recipe is a Swiss Chard Gratin. 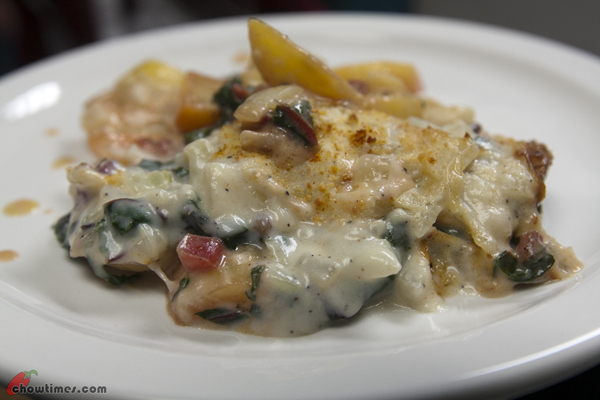 This is a healthier version to the regular potato gratin with the addition of Swiss Chard. You can use spinach instead. 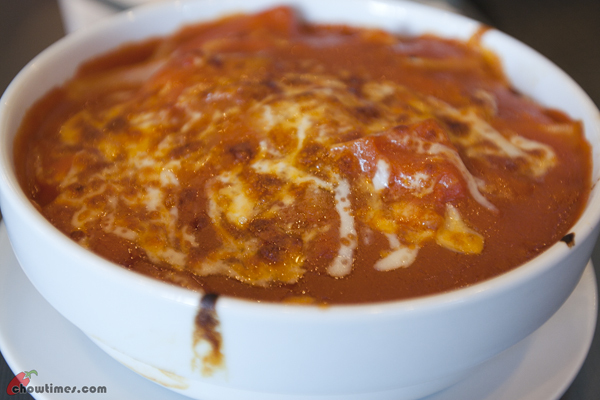 All the participants love this dish. You can prepare this dish in advance and bake it when you need it. 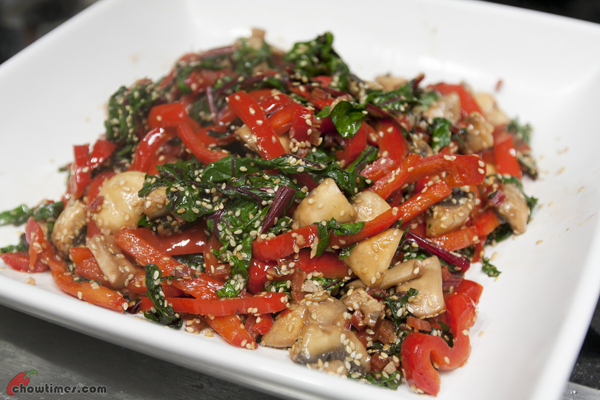 A great dish for potluck party and the color of Swiss Chard makes this dish very festive. 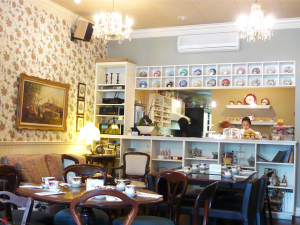 Polly and I went to Adonia Tea House for another high tea. 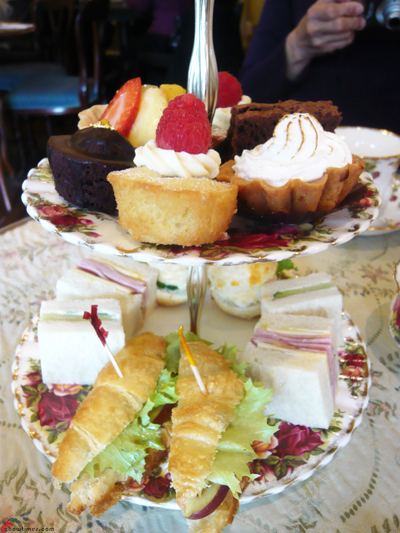 We enjoyed the mini high tea at The Secret Garden Tea that we want to try more. Driving past the area, we would not have figured that Adona is a tea house. 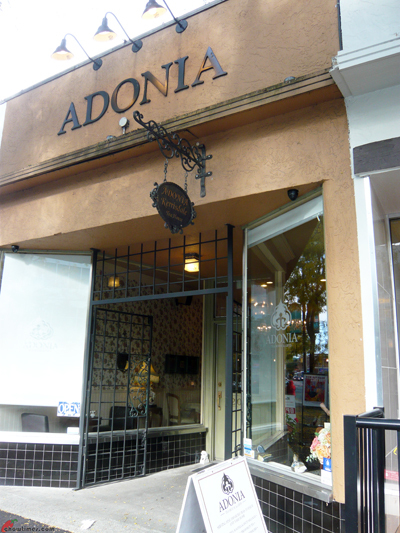 From the earthy tone building and a name like Adonia, we would have thought that this is a Greek restaurant. 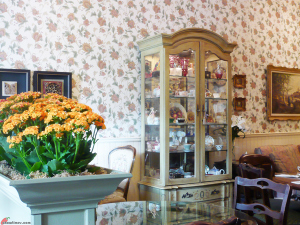 Adonia Tea House is decorated with flower wall paper and very lady like decoration. We believe that this is Chinese owned as we heard some of the people behind the counter speak in Mandarin. 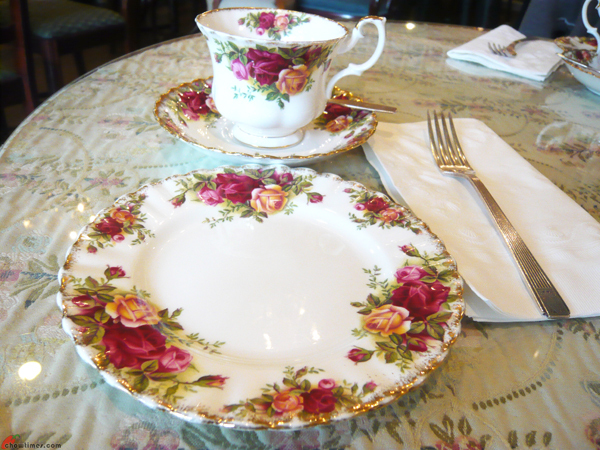 It’s all about the beautiful tea cup, saucer and plate when coming to English tea.